Wrong-way head on car crashes are a serious and sad reality in our society today. These accidents are typically caused by intoxicated, drunk, stoned or drugged motorists who do not realize they are travelling the wrong way. Typically, these reckless motorists are not just impaired, tipsy or buzzed drivers. They are usually hammered, wasted or nearly blacked out. 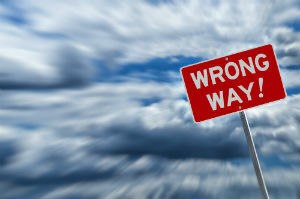 Wrong way driving is particularly deadly when a vehicle is travelling opposing the lawful direction of traffic on a divided highway, or highway/ freeway exit ramp. If you were injured in a wrong –way vehicular wreck or a loved one died as a result of a head-on crash in Rhode Island or Massachusetts then it is important that you retain a good RI or MA Personal Injury Lawyer or Wrongful Death attorney. The interrelationship between drunk driving and head-on auto crashes simply cannot be ignored. Too many accidents are caused by sloshed, obliterated and tanked motorist who drank too many alcohol beverages at a bars, parties, taverns or nightclub. 65 Percent of 20-39 year old wrong way Collisions Caused BY Drunk Driving! On February 28th, 2014 there were two wrong way auto accidents in Rhode Island and Massachusetts. Wrong way accidents often have criminal implications and could lead to imprisonment especially if someone is killed in an automobile wreck.